In two days' time, on May 11, Samsung's current flagship will have been available on the market for exactly a month. We do know that the first day sales of the Galaxy S5 were significantly higher than the first day sales of Samsung's last year forerunner, the Galaxy S4. At the same time, the launch weekend sales of the device also beat the ones of its greatest rival, the Apple iPhone 5s. All of these facts indicate that although it received a fair amount of critique, the Samsung Galaxy S5 would probably break a sales record or two and become one of the best-selling gadgets of 2014, just like its predecessor. In this line of thought, it is quite curious to compare the overall adoption rates of the two devices, the S4 and the S5, for a bigger amount of time and see if the trend is still present. Luckily, the folks at Chitika, an online advertising network, released a statistical report that gives us more insight on the matter. 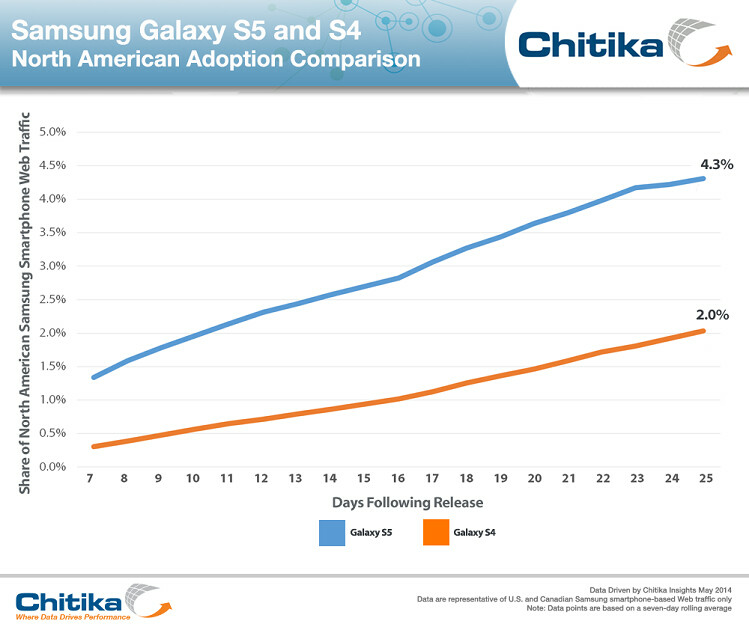 According to Chitika, the Galaxy S5 accounted for 4.3% of all Samsung smartphone web traffic in North America just 25 days after it got launched, from April 11 throughout May 5. Can you guess how the Galaxy S4 fared for the same amount of time back in 2013, from April 25 to May 19? Well, the former flagship was responsible for just 2% of the web traffic. Pretty impressive, right? We should also take into consideration that nowadays the smartphone market is more saturated with high-end smartphones than it was a year ago, which makes Galaxy S5's market penetration even more spectacular. Chitika also points out some of the factors that could be driving the Galaxy S5's sales forward. Apart from the popularity of the Samsung brand, the big 5.1-inch display and the IP67 dust- and water-resistance also made the Galaxy S5 quite appealing to the mass consumer. The Galaxy S5 will undoubtedly be one of the hits on the smartphone market this year, but Samsung's rivals won't stay idle – on the contrary, their smartphones are going to fight tooth and nail with the Galaxy S5 for a bigger share of the market. Exactly! The little evil hipster in people makes them hate anything that is popular. It is a great phone and aside from subjective opinions, it is a spectacular competitor. I personally like it the most because I felt like the other top competitors didn't bring anything new to the table but they are by no means bad phones. Considering its still one of the few flagship phones that let you exchange the battery. Not to mention there are a number of 3rd party back cover plates now, as well as a 7500mha battery for the S5 now. The camera is really fast and the only one that I know of that offers 240fps slow motion video capture. Plus once you get use to the finger scanner, it works every time for me. Camera pretty fast, but the video recording lacking to focus the object correctly start from 10cm or less than that. Try play with your camera, if you dont believe me. My grand duos can do much better. Great catch. If this is true , I'll never buy S5, but will buy iPhone 5s POS or M8 POS. (aluminum) Happy??? Not gonna exchange my S4 for anything but the Lumia 930 atm. I'm getting....930 orange.... Can't wait. I replaced the Note 2 for the S5 and is not such a bad phone like a lot of people are portraying it to be, it is in a nice case and no perforation is seen :) I actually find myself using the heart rate monitor quite a bit and the pedometer oh and the screen is fantastic. I kind of miss the bigger screen of the Note but who knows, maybe next year i get the Note 4 or 5. Battery life? Awesome, I can almost pull two days of battery on this thing. 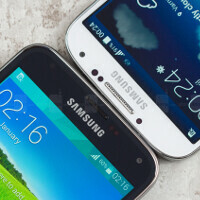 No KitKat for S III:http://www.xda-developers.com/android/samsung-confirms-no-kitkat-for-the-international-galaxy-s-iii-and-galaxy-s-iii-mini/? That's just the Mini and the international (Non- LTE 9300) S3. The U.S. S3's are getting/have gotten it, so did the international S3 LTE (i9305), plus the various Asian models. You know, not everyone on this site is American. I know. Americans stick to the subject of the article. hello haters. love these articles. #NumbersDontLie. No "band aid case" there. But great look-and-feel device. And you DON'T own Note 3, iboy. Right? The fact is I own Note 3 since late Oct 13 (i like very much) and another fact is I dont like the ish*t because their tiny screen and ecosystem. I just disappointed with S5 back case look almost same with their old phone, I hope the Note 4 will look better. These web traffic statistics don't mean much. It could be the same number of phones for all we know. With the expansion of LTE availability since the launch of the S4, we could be seeing more web traffic just due to the higher speeds.